I just had to have this pattern, I knew I had the perfect yarn for it. So I purchased it the first day it was out and started knitting right away. I ran into a couple little snags, but then rethought them out and with the help of Maalfrid and my friends on the Ravelry groups I figured most of it out. We were driving across state after state and I was knitting like crazy. So I took her picture curbside. This is my first Maalfrid pattern that I have started and the outcome is wonderful. Everyone on Ravelry loves it. So thank you for designing the perfect little outfit. You have done a good job here Dorry! Your doll is very nice. I like the colours you have chosen. May be you are as eager to knit whilst travelling as I am??? I am glad you like my pattern! I love to design them! 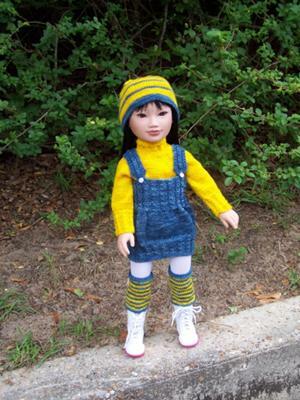 Your color choices are so vibrant and perfect for this doll. You've really shown us that Malfrid's patterns are perfect for all types of dolls, from babies to teen types. You did a beautiful job of knitting this pattern! Excellent work!